Combination Wrench Sets Are Designed For Various Industrial, Mechanical And Automotive Applications. Combination Wrench Sets come in an assortment of lengths, head sizes and wrench quantities. Combination wrench sets range from 4 pieces up to 31 pieces in various size assortments. Choose from Fractional or Metric measuring systems. Some wrench sets are non-sparking for safe use in hazardous work areas. 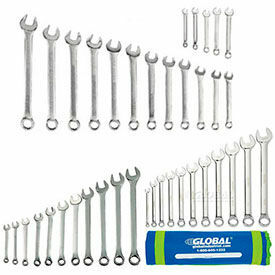 Combination Wrench Sets are offered from several trusted brand names. Ratcheting Combination Wrench Sets Are Ideal For Use In Various Mechanical, Industrial And Automotive Applications. Ratcheting Combination Wrench Sets are available in a variety of sizes and styles to suit assembly needs. 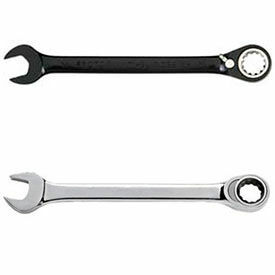 Wrenches have ratchet ends as well as traditional open-end wrench, and are available in Metric or Fractional measuring system. 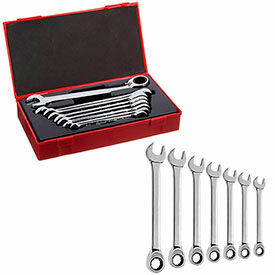 Wrench sets are available with 7 up to 22 pieces. Choose from several trusted brand names. 12-Point Fractional Combination Wrenches Are Versatile, General Purpose Wrenches. 12-Point Fractional Combination Wrenches are made of steel, aluminum bronze or copper beryllium for long lasting durability. Some wrenches are non-sparking for safe use in hazardous work areas. Wrench sizes range from 3/16" to 51mm. Available finishes are Black Oxide, Bronze, Chrome, Copper, Full Polish, Full Polish Chrome, Natural, Non-Sparking, Satin and SuperKrome. SAE Standard Combination Ratcheting Wrenches Are Used For Accessing Hard To Reach Fasteners. Combination Ratcheting Wrenches are made of alloy steel or vanadium steel for corrosion resistance and long lasting durability. Available in many styles, lengths, opening sizes, points and handle types to meet a variety of job requirements. Styles are Combination Ratcheting Wrenches, Reversible Combination Ratcheting Wrenches, Reversible Ratcheting Wrenches and Stubby Reversible Ratcheting Wrenches. Color finishes are Chrome and Polished. Opening type is Open/Box. 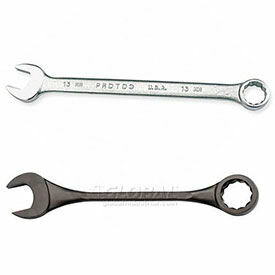 Metric Combination Wrenches Are Versatile, General Purpose Wrenches. Metric Combination Wrenches are made of steel, aluminum bronze or copper beryllium for long lasting durability. Long pattern, 15-degree angle and 12-point box provide optimum performance. Some wrenches are non-sparking for safe use in hazardous work areas. 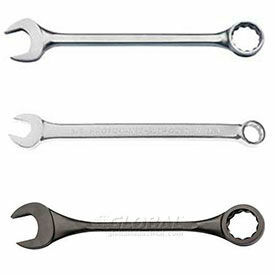 Wrench sizes range from 5mm to 80mm. Available finishes are Black, Black Oxide, Chrome, Copper, Full Polish, Full Polish Chrome, Natural, Non-Sparking, Satin and SuperKrome. Metric measuring system. Metric Ratcheting Combination Wrenches are Designed For Specialty Spline Bolts to Minimize Bolt Weight and Size. Metric Ratcheting Combination Wrenches have a 15° angled offset to help keep shank clear of obstructions. Chrome-vanadium box ends and switch levers provide high strength and long lasting durability. Box end is countersunk for easy application to the fastener. Spline design enables the wrench to contact conventional fasteners away from the corners, which applies force over a larger area, reducing risk of fastener scoring and helps prevent rounding of the corners and other fasteners damage that could lead to Foreign Object Damage (FOD). The high contact surface area which is away from fastener points enables turning of highly rounded fastener. Anti-Slip Design (ASD). Corrosion resistant color finishes are Black Chrome and Full Polish Chrome. Sizes range from 6MM to 36MM. Reversible and non-reversible styles available. OALs range from 4-7/8" to 19-5/16". Points are 12 and Spline. 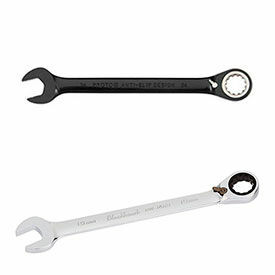 SAE Combination Wrenches Are Used For Personal Or Professional Applications. SAE Combination Wrenches are made with solid Chrome Vanadium Steel for long lasting strength, durability and dependability. Open end and box end. Max-Drive™ design of the box end allows for 15% more torque than standard wrenches and helps reduce fastener rounding. 15° box end offset for additional knuckle clearance. Full polish satin finish for anti-corrosion protection and easy cleaning. Designed to exceed ANSI industrial specifications.